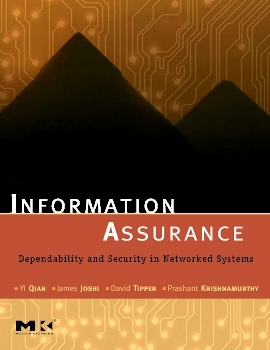 James Joshi, Prashant Krishnamurthy, and David Tipper have edited a volume on Information Assurance with Yi Qian of the University of Puerto Rico. "Information Assurance: Dependibility and Security in Networked Systems" was published in November 2007 by Elsevier and is intended for use by researchers, professionals and students in information security technology. The publication is extremely timely in that society is increasingly dependent upon network techologies – which come with new and complex threats to the availability, integrity, and confidentiality of electronic information. The book combines coverage of both security and survivability in a networked information technology setting. Each chapter provides insights from leading industry and academic researchers about state-of-the-art survivability and security techniques; they further explain how these components interact in providing information assurance. Topics covered include failsafe design features, design for system and network survivability, integration of dependability and security, monitoring and securing all-optical networks, evaluation of the robustness of operating systems, and integrated fault and security management. Joshi is an Assistant Professor; Krishanmurthy and Tipper are associate professors here at the School.